Thai language is relatively versatile, “gin khao” not only refers to “to eat rice”, it can also mean eating anything at anytime of the day. We’re guessing that’s the message this new gem at East Coast Parkway next to Burger King fast food restaurant wants to deliver – to be able to relish in good food anytime of the day. Simple as it is, the eatery oozes charm with industrial elements in their interior design. Diners are bestowed with the luxury of space with widely spaced out seats and family-friendly fares good to share, providing an ideal place for large groups to dine in comfort. 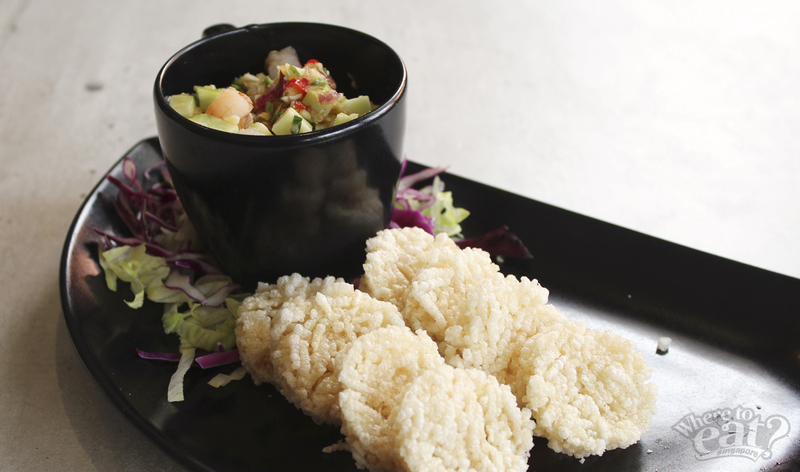 To start the indulgence, the mild, tangy appetiser Prawn and Green Mango Relish was served. Fried rice crackers alongside with perky mango and prawn dip makes an interesting combination and a good start to the actual meal. It can be slightly spicy for some but it can still be addictive. 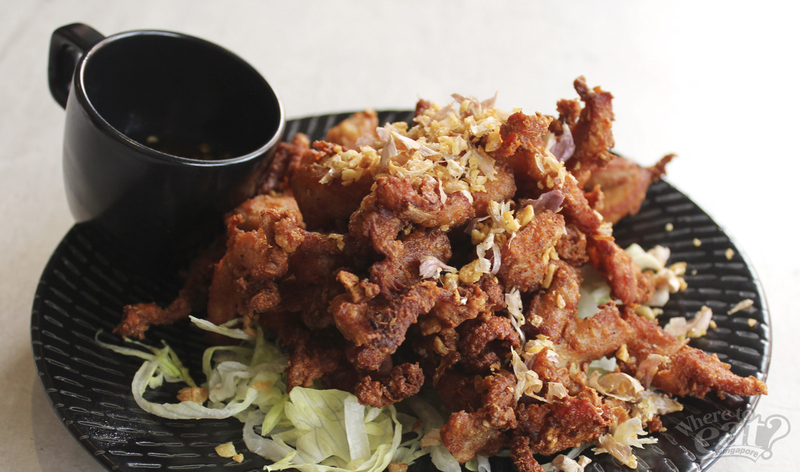 Another addictive bite would be the Gai Tod Had Yai – Deep Fried Chicken in Had Yai Style. This is basically chicken strips that are marinated, then deep fried to a perfect crisp, and served with deep fried fragrant garlics and onions garnishes. The sauce that accompanies it might seem fiery red but when eaten together with the chicken strips, this is absolutely appetising-whetting. No Korean barbequed meat here but Moo Yang certainly do the trick. 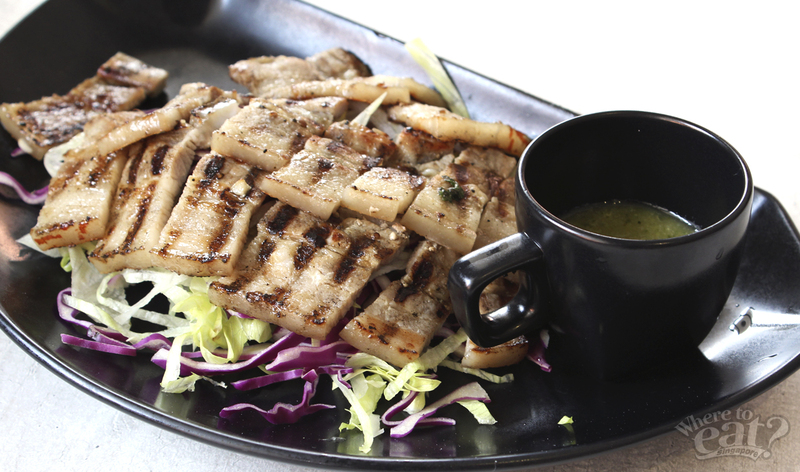 Thai style thinly sliced pork belly meat and then grilled to a slight crisp. What will surely win heart is the stimulating green chilli dip that comes with it – a blend of grinded green chilies, parsley, some white vinegar and lemongrass juice. 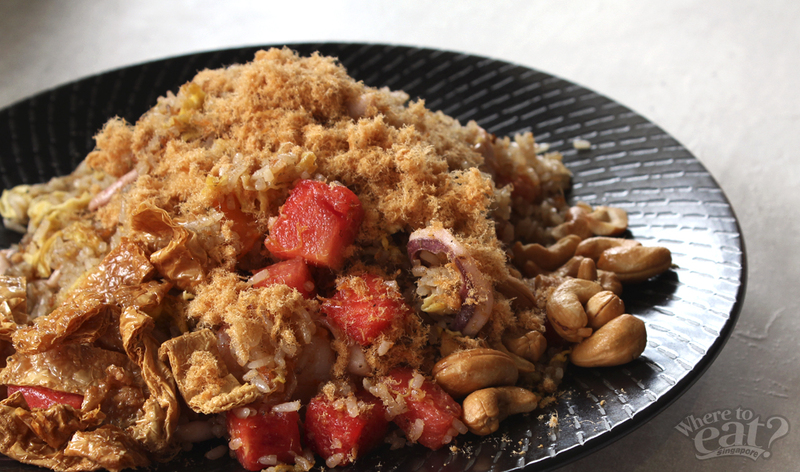 A good dish for sharing, Khao Phat Dtaeng Moe features a funky combo of flavorful fried rice with watermelon, garnished with fried tau kee, cashew nuts and pork floss. Unlike pineapple fried rice, this dish is a first and only in Singapore, and it makes you think “does this work?” And yes, we tell you it does. You will sense the wok hei in their rice, taste the texture of pork floss and nuts, and also cure your curiosity of how stir-fried watermelon taste like. How could you do without tom yum soup at a Thai food restaurant? Better still if it can be shared among 3 – 4 adults. 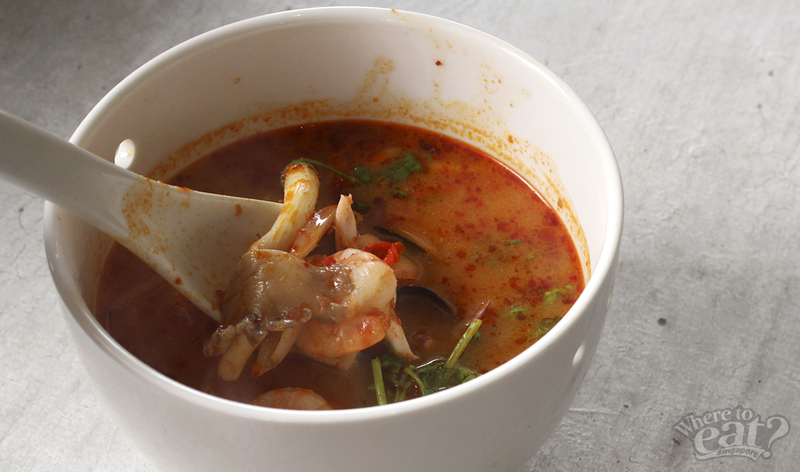 Their tomato-based Khao Phat Talay (Tom Yum Seafood Soup) fits the bill – filled with prawns, squids, and even mussels, it has a manageable spiciness that goes well with other dishes. The soup is a little creamy, perhaps from the use of chicken broth which is boiled together with Kaffir lime, Thailand green lemon and other spices to achieve a kick. Something that is unique to the Thai menu is the Kang Ob Woon Sen, juicy crayfish simmered with Thai garlic and pepper sauce in clay pot over high heat. 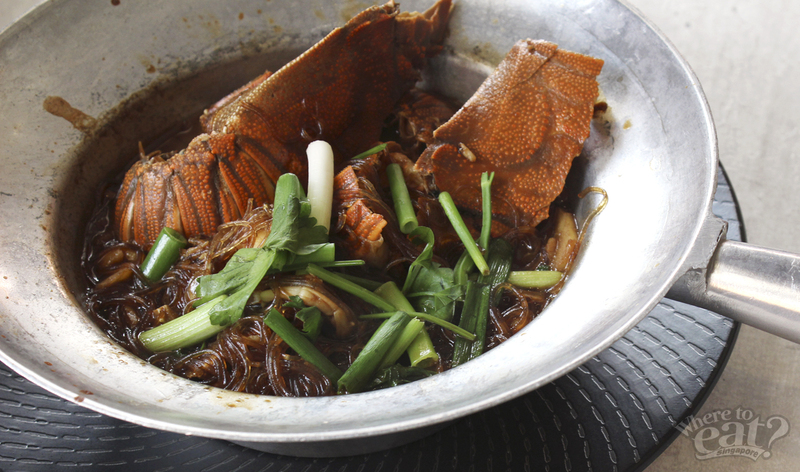 The star of this dish would undeniably the smooth tung hoon that lies underneath the firm, briny crayfishes. Soft and luscious, the tung hoon were simmered in the garlicky sauce and inclines towards the heavy palate. Food mash-up are all in the trend right now and Gin Khao really did push it to the limit – imagine Green Curry Gelato and TOM YUM Gelato. Be reminded: not for the faint-hearted. Sweet at the first bite, the green curry will leave a spicy aftertaste to it. As opposed to the Green Curry Gelato, TOM YUM Gelato taste exactly like how tom yum soup would be – spicy. Try this if you’re up for a challenge. 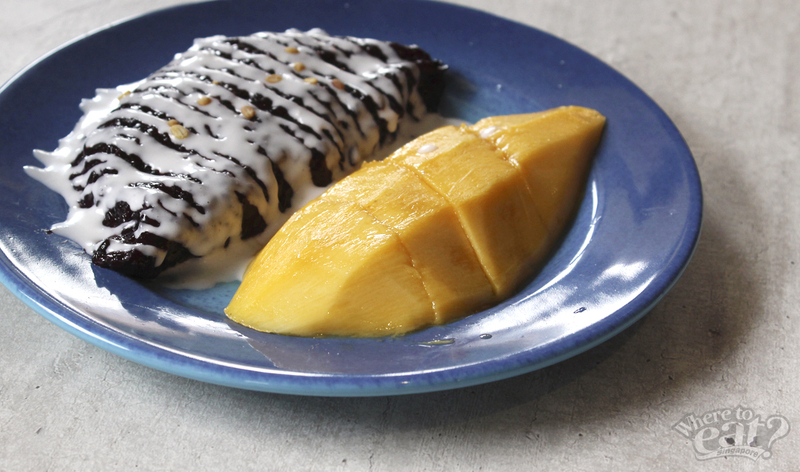 Lucky for us, Gin Khao still do serve an all-time favorite Thai dessert – Mango with Black Sticky Rice. The dish, served warm, is half made up of black glutinous rice with coconut milk drizzled over and the other half, a halved mango. The black glutinous rice is amazingly tender and the entire dessert is not that sweet afterall. 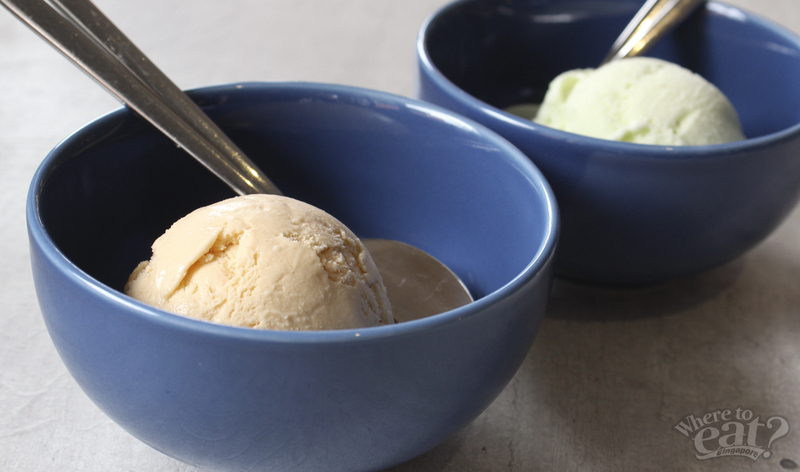 If you’re more adventurous, try their Green Curry Gelato with Sticky Rice instead. 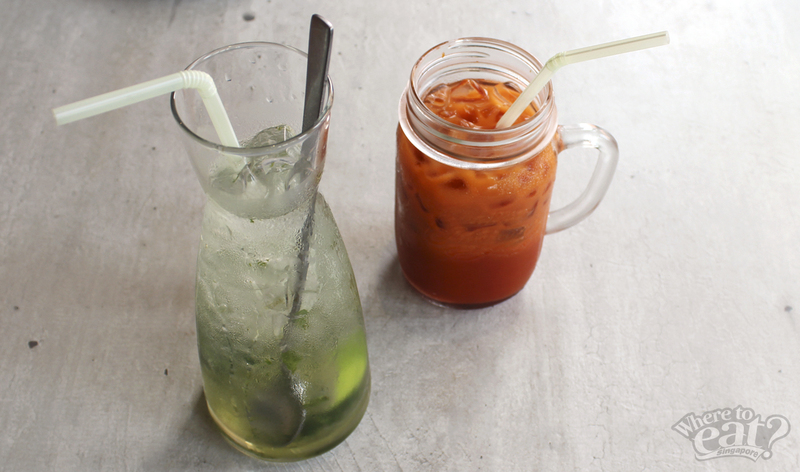 For their thirst quenchers, they offer fresh choices such as Coconut Mojito and Thai Ice Rose Milk Tea. Since coconut juice are raving these days, Gin Khao grabbed the opportunity and combined coconut juice, lime and mint together to make a classic drink sparkle. Thai Ice Rose Milk Tea is slightly on the sweeter note with milk tea infused with rose syrup. Despite being a tad off the beaten track, Gin Khao would be a great spot for large groups to get away from the hustle and bustle, especially if you’re somewhere along the East side. Make reservations if you’re thinking of heading there on Saturdays and Sundays, they can be packed at times.